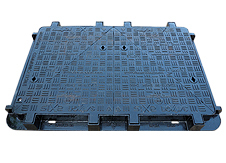 100mm Deep- D400 Heavy Duty Hinged Ductile Iron Highways Cover. • Suitable for carriageway and fast moving traffic. • A.M.P. 'S Patented anti-movement frame technology incorporated. • Supplied locking as standard with single captive stainless steel cap head bolt. • High security locking bolt available as an option. • Sequenced opening- to enable single point locking for ease of use. • Frame mechanical lifting points provided where detailed. • Ductile iron to ISO 1083 for improved weight to strength ratio. • Black coated finish to BS 3416.